Dan anchored last Friday’s episode of Nightline in an episode that dealt with a variety of topics including a controversy with Black Friday holiday shopping, an animal clinic for exotic animals and Batkid. Dan introduced the first topic: “Black Friday can be a discount shoppers dream, but during the holiday season in particular, some will be looking for more than just a discount, a real steal, to the tune of billions of dollars. So as retailers prepare for the big sale season, they’re also going to great lengths to prepare for those trying to avoid paying it all.” The next topic follows some rather grueling jobs which include veterinarians performing check-ups for tigers and finally Dan introduces the inspiring story of Batkid who had his dream come true thanks to the Make-A-Wish Foundation. 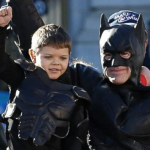 Batkid AKA Miles Scott was able to save San Francisco with the help of over 200 willing volunteers who created a real life Gotham City. Watch full clips from the episode here.